I have gone through a bit of obsession with Greek food lately. I don’t know if anyone else does it but I will get hooked on a certain type of food (Greek, Italian, Mexican, fish and seafood, veggies, etc.) and want it just about everyday. Not the same food, but the flavors. It kind of drives my family a little batty at time. OH well, I do the cooking so I guess what I decide goes right? Although I do try to give you all a variety of recipes during the week. I don’t to make you just as crazy as my family! I did a Greek Burger back for #SundaySupper’s Father’s Day post and it was soooo good. I think that was when my little mind started cranking out ideas for recipes. Do you ever wake up in the middle of the night with recipes flying through your head to the point that you just have to get up and start writing them down? Oh, maybe that is just my weird thing, but I seriously get some of my best ideas in the middle of the night! Last night I had to fight the urge to get up and start canning dilled green beans! Wacko!! My friends, this was a meal that made them stop complaining though. My son isn’t a huge feta fan (strange but true) so I wondered if he would like this, but he did. Kevin’s son eats anything I make as fast as I put it in front of him, which I haven’t quite decided if it is a testament to how good my food is or just being a 20 year old boy that is happy someone else is cooking for him and he doesn’t have to eat McDonald’s every night. I have decided to believe the first idea. This is a great summertime meal. Sitting outside by the grill enjoying the tangy kabobs along with the salad? So good! 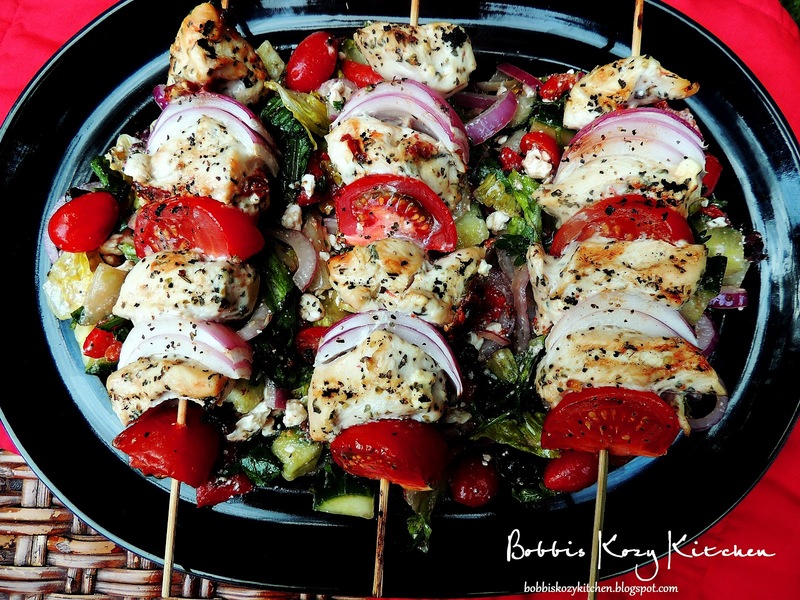 You could also make these kabobs with some rice pilaf. Toss a little bit of feta in after the pilaf is cooked along with some lemon, mmmmmm heaven!! In a large shallow baking dish, combine the yogurt, feta, sun dried tomatoes, oregano, onion powder, garlic powder, salt, pepper, and lemon zest and juice. Stir to combine well and add the chicken, turning to make sure it is completely coated. Cover with plastic wrap and let marinate in the fridge for at least 4 hours to overnight. Remove chicken from the marinade and thread onto skewers, alternating with the onion and tomato wedges. Discard leftover marinade. Grill over medium high heat, turning to assure all sides are cooked, until the chicken is no longer pink and the juices run clear. While chicken is cooking whisk the olive oil, lemon juice, garlic, red wine vinegar, and dried oregano in a small bowl. Place the lettuce, tomatoes, cucumber, onion, olives and feta in a large salad bowl. Toss with salad dressing. Salt and pepper to taste.